The Indian Himalayan Region (IHR) is witnessing the impacts of climate change on its natural resources and communities. But the impacts of the changes being observed in this mountain region is not restricted to the uplands. The lowland areas too are being strongly affected. The geographical and social linkages between the uplands and the lowlands drive various processes. Due to these linkages, issues such as extreme events arising in one region can have far-reaching consequences on the other. However, these two landscapes are often viewed in isolation which inhibits the consideration of full dimension of issues spanning upland and lowland. Climate impacts in the mountain regions can result in multi-sectoral impacts in the lowlands. Considering the wide-ranging ways in which communities in lowlands interact with and depend upon mountain environments, it is important that adaptation planning on how to respond to climate risks across IHR is based on a complete understanding of the current and the future changes occurring in both lowland and upland regions. This science brief highlights the linkages between upland and lowland areas with respect to specific themes in mountain ecosystems such as water, agriculture-horticulture, ecosystem services, hazards and disasters, tourism and transportation networks. The purpose of this science brief is to make a case for special attention to the Himalayan Region for the well-being of South Asia, in general, and that of India, in particular. This document is based on the findings from a pilot study done for Kullu district, Himachal Pradesh, India under the Indian Himalayas Climate Adaptation Programme (IHCAP), a project of the Swiss Agency for Development and Cooperation (SDC) and wider experience with processes occurring across IHR. Water: The melting of snow and ice in mountain regions contributes to the flow of water in the rivers downstream. Water stored in Himalayan glaciers feeds seven major rivers of Asia. Although, there are still uncertainties regarding the extent of impacts of climate change on the water reserves in IHR, the potential changes in rainfall, snow cover, monsoon timing and distribution will have implications on the quantity and quality of runoff from the mountain catchments to the lowlands. Agriculture-horticulture: Agriculture and horticulture supply not just the raw materials to industries in the mountain region, but also several crops to the lowlands. With climate change adversely impacting the production of important agriculture and horticulture crops in IHR, the supplies of these crops to the region and to the lowlands is likely to suffer. Ecosystem services: While local inhabitants in mountain regions directly depend on the biodiversity for sustenance, lowland inhabitants too place great value on goods and services coming from mountain regions. This is particularly true for medicinal plants, some of which are unique to specific elevation zones in high mountain environments. However, climate change is causing noticeable effects on the life cycles and distributions of medicinal plants. The impacts of climate change on forests in IHR and on the ecosystem services they provide are affecting communities in both upland and lowland areas. 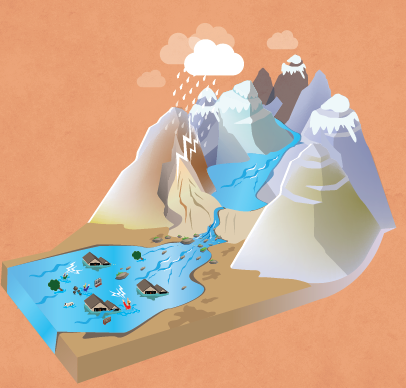 Hazards and disasters: Disasters originating in mountain regions can often lead to a chain-reaction of events, where processes such as glacial lake outburst flood (GLOF) transform or initiate secondary events, progressively increasing the downstream reach and consequences. With climate change influencing both the frequency and magnitude of landslides in mountain regions along with glacial lakes increasing in number and expanding in size as the ice melts, the risk of related far-reaching lake outburst events is expected to increase substantially. Tourism: Tourism in mountain regions generates economic growth, infrastructure development and employment opportunities for the mountain communities. However, a rapid influx of tourists from lowlands and associated growth in tourism infrastructure also brings challenges, and puts further pressure on the already sensitive natural landscapes. Climate change further aggravates the risk to tourism sector in the region. Major tourist destinations in the Himalayas, may concentrate large numbers of people at the same time in hazard-prone regions, thereby increasing risk. Transportation networks: High mountain passes have for many centuries served as important transportation routes. They provide an economic lifeline that facilitates tourism and the movement of goods and agri/horticulture products, linking different regions. Impacts of climate change such as changes in flood and landslide activities threaten vital transportation networks passing through mountainous areas. Monitoring of the high mountain environment for climate adaptation: Systematic monitoring of the high mountain environment (including the cryosphere) in the Himalayas is essential to ensure that adaptation decisions for different altitudinal regions are evidence-based and well supported by latest scientific understanding. Such monitoring will help in tracking climate risks originating in the upland but having the potential to cause impacts or damage in lowlands as well. For example, monitoring of hydro-meteorological conditions in upland areas can help in early detection of relatively slowly evolving as well as rapid onset flood threats for downstream areas. Availability of such data can facilitate designing and implementation of appropriate adaptation response. Formulation of specific policies and adaptation finance mechanisms for the Himalayas: Specific policies customized for the Himalayas are required as the policies designed for the plains might not be suitable for mountain ecosystems. Priority allocation of funds and formulation of policies for the Himalayas is required in the context of climate change adaptation because focussing on the high mountain environment will lead to risk reduction for lowland areas as well. Green Bonus for Himalayan states: More support needs to be provided for conserving forest cover in the Himalayan states. Provision of green bonus will incentivize management of natural resources and environmental conservation in lieu of developmental activities. Conserving forest cover will not only benefit mountain communities but also lowland areas by ensuring provision of key ecosystem services such as water and various food commodities. Awareness programmes on the significance of mountains: Mass awareness and education programmes are needed in the lowlands to make the communities as well as decision makers aware of the significance of mountains, their linkages with lowlands and the need for conservation and sustainable management.